SGN’s newest social game for the iPhone, MiniTycoon Casino, is now available worldwide. Launched at TechCrunch Disrupt in September, the game was initially rolled out in Canada, Australia and New Zealand but today is available around the world. You can download the free social gaming app in the App Store here. The game is similar in some ways to Zynga’s Farmville, except instead of building your own farm the game allows you to build and run a 5-star casino. You can decorate your casino, buy machines (slots, poker tables and more) and hire dealers. 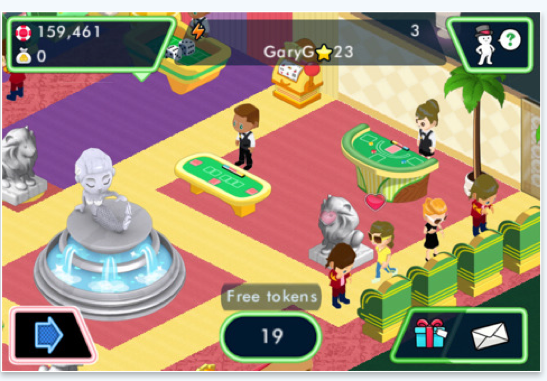 And you can visit your friends’ casinos to earn energy, send gifts, send messages, and more. As the social game scales worldwide, SGN is prepared for supporting a high number of concurrent users (think Farmville-like numbers of users). Mini Tycoon Casino is the first game in this series and SGN plans build similar games with different themes. The gaming company has big ambitions for the the app—MiniTycoon Casion is expected to bring in $1 million in revenue per month.